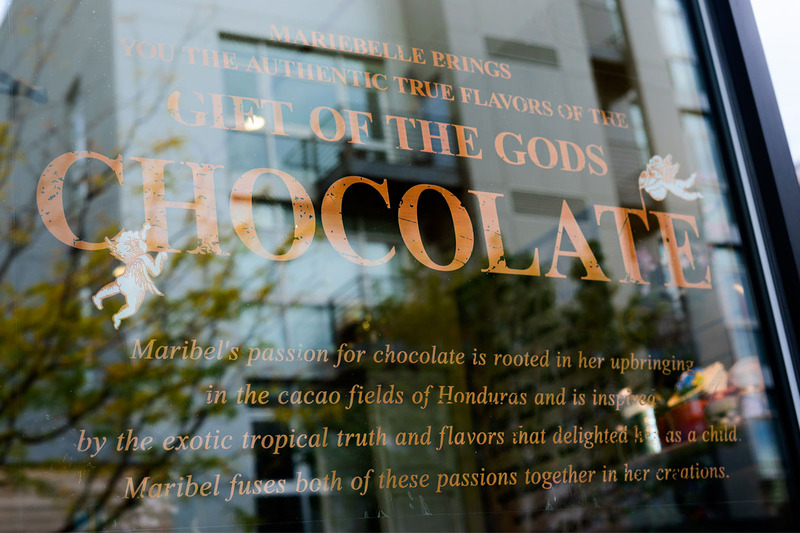 I popped into MarieBelle’s chocolate bar in Greenpoint one sunny day, way before I even heard there was a holiday for cacao. 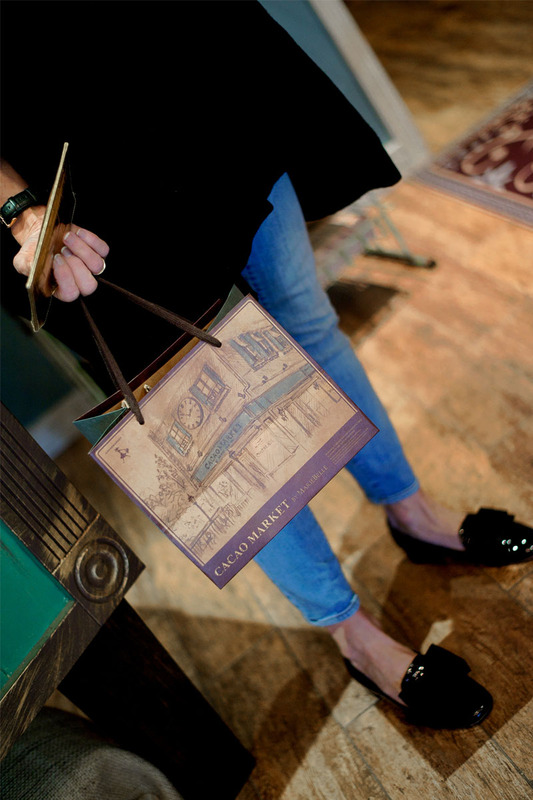 I had heard about this boutique chocolate bar when it originally opened in the city, and so after a delicious lunch in this green borough, a friend and I sauntered in for some sweet treats. Oh wow, what a wonderful shoppe (the English spelling is deserved in this elegant gem!) 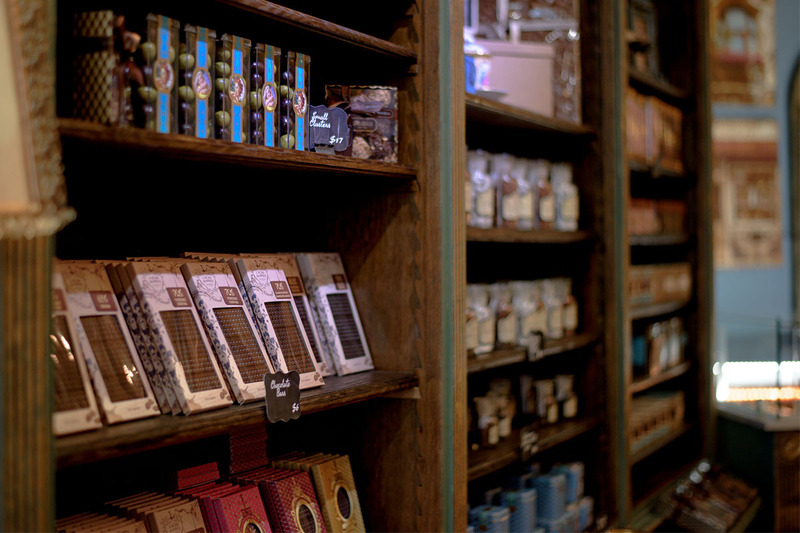 It is the prettiest chocolate bar I have ever been in, (trips to Europe included, even prettier than Cafe Sacher in Salzburg, and that was up until now, my very favorite sweet spot.) 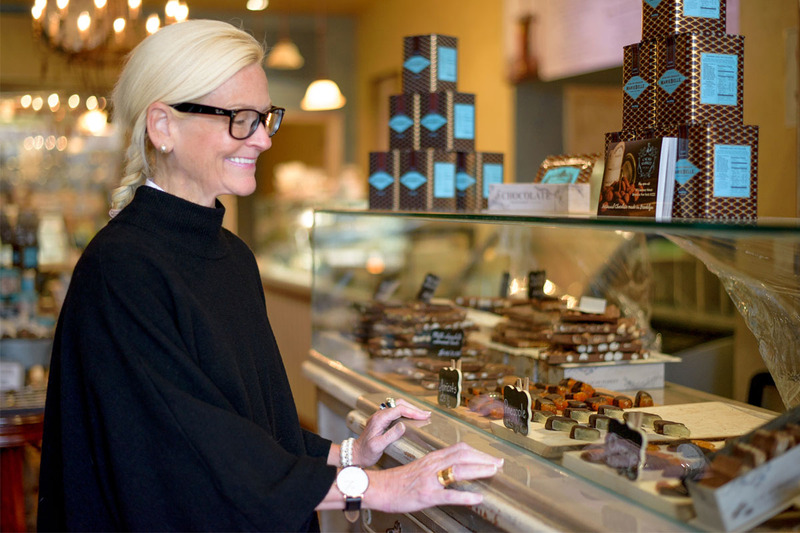 MarieBelle make their ‘own take’ on delicious signature chocolates (craftily, as soon as you walk in there is a rather large sampler in a makeshift wooden, slatted coffee box with a selection that is so decadent, you just want more and more, and naturally spend more and more.) 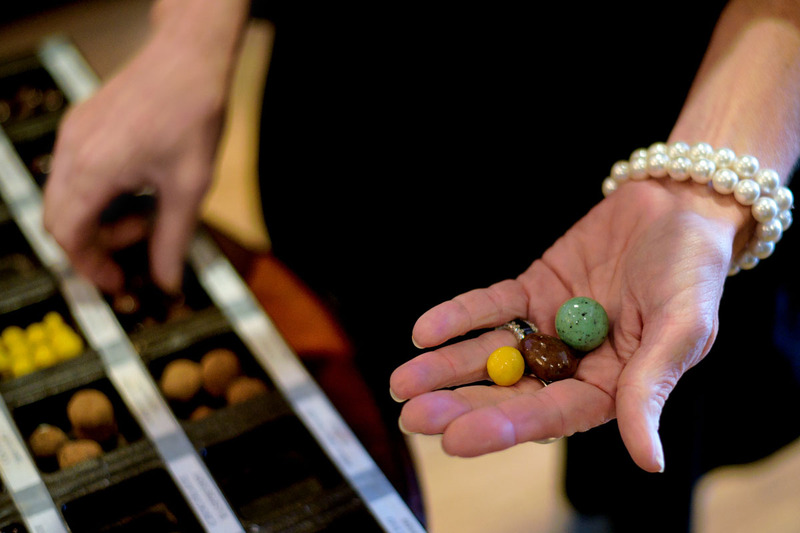 The yummy chocolates at this off the beaten path outpost are topped with quirky, colorful – whimsical designs and every one that I tasted was better than the one before. It has been said that some of the best of her best are flavored with spices, cardamom and cinnamon chocolates, I think not. I favored the fruit-based choices like mango, coconut, and lemon. Oh, gosh that was a happy and full – filling day. 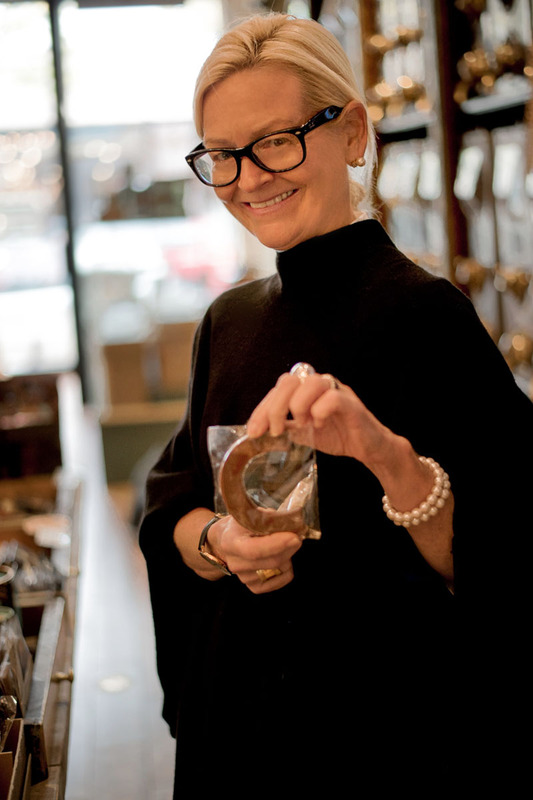 Past the actual coffee bar is a quaint tea room, called the Cacao Bar with a wide view of the pristine kitchen, (not a hint of a chocolate mess anywhere) where all the action is – as everything MarieBelle makes, is now hand made in Brooklyn, and for all to see. You can sit on gilded arm chairs or at the communal table and watch magic in the making. Swells of sugar adorn this glass box inviting the littlest of eager trick or treaters in for a peek. 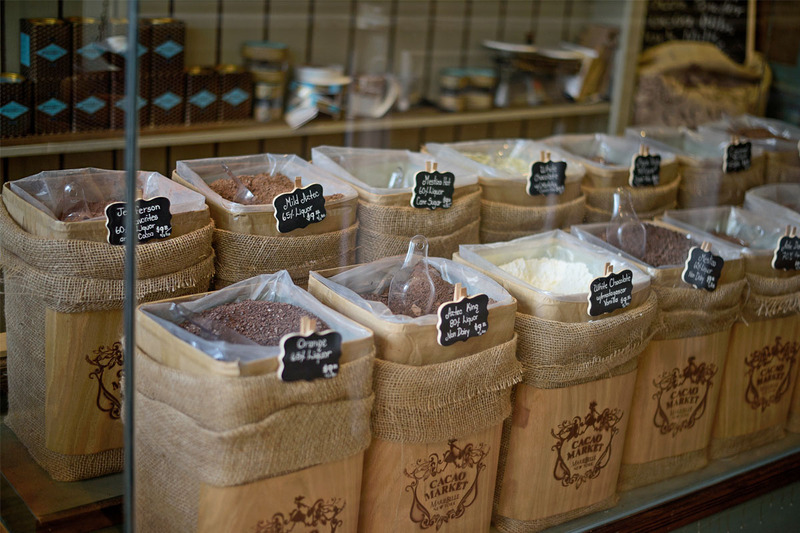 The cute store offers chocolate lovers a more rustic and artisanal approach to chocolate, and it is delightful to see how those pretty little balls, bark and chocolate covered ‘just about’ everything are made. 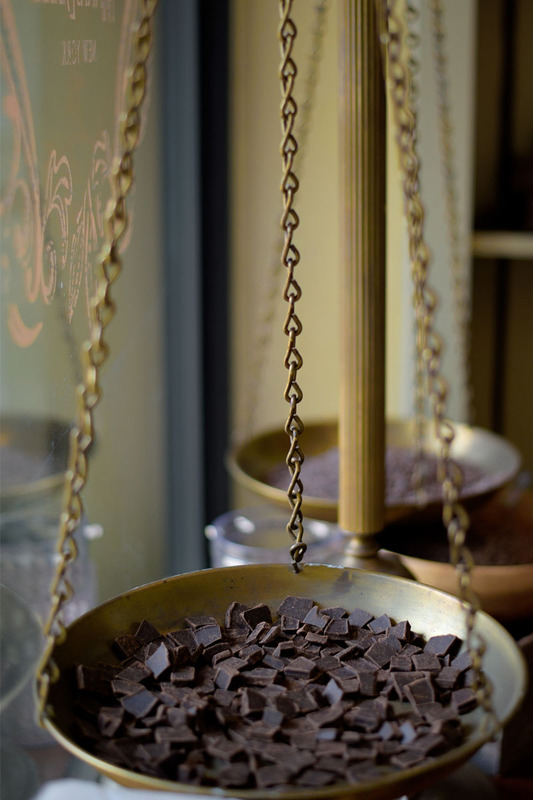 They pride themselves on using the highest quality single original cacao. I am certainly not a chocolate expert, but the proof is in the pudding, and, that dish too, is a delicious chocolate sensation. Pieces of chocolate aside, the specialty of the house is very hot, and it is chocolate. So hot in fact, I ignored the warnings of ‘careful its really hot’ and speedily took a big sip and then burned the heck out of the cool cheeks that were coddling more chocolate insanity. It hurt, but it didn’t stop my obsession for another go at it. So, I waited for it to cool and when it did, took my chances again. Even with a sore throat, that was the most incredible, fudgy, creamy, milky cup of hot chocolate this dessert decliner has ever tasted. The next time I try one, naturally, I will join the kids taking a peek at the fudge making through the glass partition while my cup simmers. At least I hope that would happen. That cup of cho is divine, and does dare you with its succulent aroma. At MarieBelle they offer two variations of the hot toddy, the European (made with water) or American (with milk.) The spicy hot chocolate is spiked with cinnamon and chipotle chile, so the menu states, but again, I’ll save those offerings for a savory meal over dessert any day of the week. 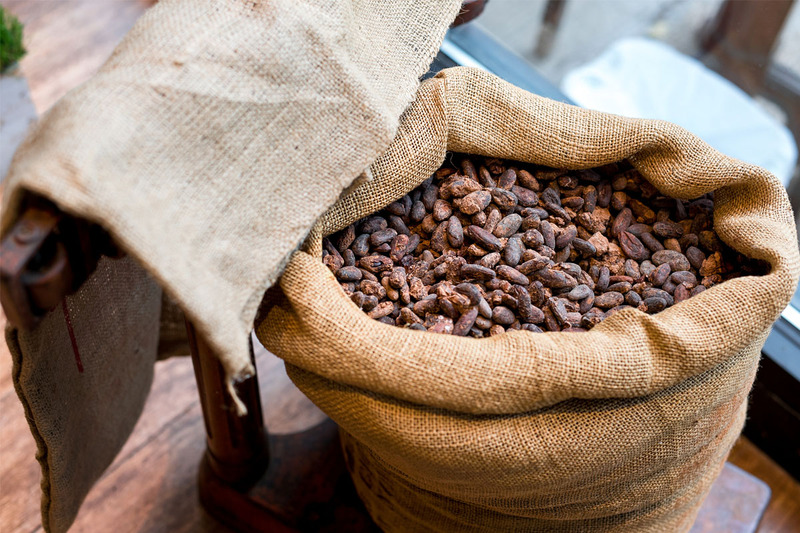 My friend tried the the Aztec dark hot chocolate, packing 72 percent pure Colombian cacao and thick enough to lick like sauce from your spoon – oopf. This whole MarieBelle drive by was less a mess than a sign of distress – it felt like a ‘food coma’ at Thanksgiving – the feeling when too much food is never enough and you wish you were wearing maternity pants. And, I didn’t run that day, so it was a flab affair, to say the least. We left there with a few bags of white and dark and colorful chocolates and a memorable taste of sweet heat on our tongues. We ate most of the takeout on the ride back over the Williamsburg Bridge. MarieBelle’s New York’s Aztec Hot Chocolate is featured as one of “Oprah’s Favorite Things.” Mine too!